I sort of wanted to dislike this book, Brodo by Marco Canora. Not that I have anything against a well-made stock, but the trendiness of it and the name "bone broth" annoy me. My mother made stock. Her mother (probably some time during the paleolithic era) made stock. Bone broth is just another name for stock. I've heard people say that bone broth is different than stock because it cooks longer. Well then, maybe you're using the wrong recipe for stock. Some people say that bone broth always includes some acid. 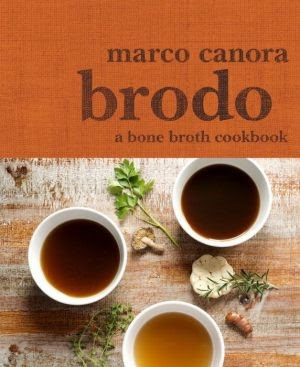 Well, Marco Canora coined the name bone broth and he doesn't add any acid to his stocks. Sometimes I think that it's perfectly fine that a well-made stock is becoming an "in" thing. It's nice that people are eating stock instead of cupcakes, I guess. But still, the name sort of irks me. Then I saw a commercial for Apple's live photos. you touch them and they move. You let go and they go back to the original. I saw the commercial and thought about the moving printed pictures in Harry Potter. But live photos aren't magic - they're muggle. And they're nothing new. They're videos. The way Apple has implemented them is a little different, but they're just videos. Then I thought that, well, bone broth is sort of the same thing. It's a different name for something we all know. And it make me like bone broth better. Because I like live photos less. To his credit, Canora doesn't say that he invented bone broth or re-invented it. He talked about how his mother would make bone broth. So he's not taking credit for creating something that has been around since the first hunk of meaty bone fell into a pot of water on a fire. I'm perfectly willing to credit him with making it popular, though. He sure as heck did that. The book starts with a pretty long introduction including the health benefits of bone broth. Obviously it's better for you than junk food. But I'm not going to jump on the bandwagon that makes it some kind of miracle health food. So, 70-ish pages later, there are recipes. The stock recipes are solid, then they're followed by what he calls "Brodo Bowls" that are ... wait for it ... soups. Those are followed by risottos, which for some inexplicable reason he calls risottos. If you're new at making stock, you might like his take on them. If you're looking for new ideas for making your stock, you might like this book. If you want more ways to use the stock you make, you might like this book. On the other hand, if throwing bones into a stockpot or slow cooker is something you do by instinct, then maybe you'd want to check this one out at the library before purchasing.